I Just Beat a Robot at Rock, Paper, Scissors. What Have You Done Today? Are humans predictable if they know they’re being predicted? That’s not something I think about every day, but the NY Times’ latest interactive feature does bring up this question. 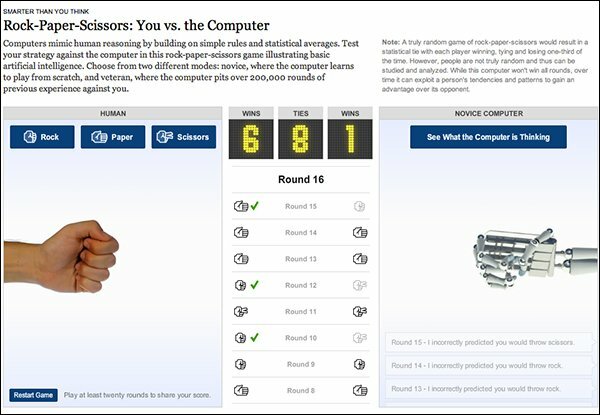 They created a digital rock-paper-scissors game that uses artificial intelligence to conquer opponents. In a truly random game, each player should win, tie and lose one-third of the time. But because people aren’t random, they can be studied, analyzed and defeated. It’s not as fancy as Jeopard y’s cute champ, Watson, but this game gathers patterns and tendencies from over 200,000 previous rounds. You can choose the novice mode, where the computer starts from scratch, or the veteran mode, where the computer destroys your rock-paper-scissors hopes and dreams with its snazzy AI hand. You can also see the computer’s thoughts, including what he predicted you’d chose and why he chose that (your patters, other players’ patterns, etc.). To see if I’m as sheep-like as the NY Times makes all humans out to be, I conducted a one-of-a-kind, highly-scientific test. After putting on my lab coat and chemistry goggles, I sat next to a petri dish and played the game 50 times. The result? I won. And not by a little bit, either. My wins were a solid 11 above the Watson-wannabe. Just to be sure of my incredible genius, I played a few more times and kept on winning. To improve my chances of being published in a scientific journal, I played a different, non-AI rock-paper-scissors game. I won again, but only by 6. Either I’m an extraordinary human being, or my deliberate disregard for first instincts paid off (I’m going with the latter). In each round, I purposely chose what I wouldn’t normally choose. And by round 17, my eyes glazed over and my clicks became totally random. So much for science. No matter how hard I tried, I couldn’t play the game properly. This will never take the place of face-to-face rock-paper-scissors, but it is one of the best online time wasters I’ve come across. It’s incredibly addictive and it’s neat to see the reasoning behind the computer’s choices. Plus, the skeleton hand is a masterpiece. It’s kind of ironic, though, that the best way to beat AI intelligence is to be as unhuman as possible. It’s also reassuring—when robots try to take over the world, I’ll just run towards them.